Details for each officer are spread over two pages. Click for an enlarged view of a page one sample. University College Dublin's Digital Library has published the first 252 pages of the Dublin Metropolitan Police (DMP) General Register as a free to access, image-only online collection. These pages hold the personnel records of some 12,567 police officers who served from 1837 to 1925 (later pages are currently sealed for data protection reasons) and provide considerable information about each individual across two pages. On the first page are recorded warrant number, name, age, height, previous trade or occupation, county, parish, post town, previous public service, and the name of the person who recommended the officer. On the second page are details of the divisions the officer was attached to, service details (dates, rank, promotions etc. ), good service pay, date and cause of removal from the force, reappointment details, and general observations. Religion was added from 1858. The entries are presented in numerical order by warrant number. They have not been indexed by surname*. 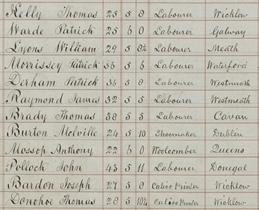 However, an alphabetical listing is available in Jim Herlihy's book 'The Dublin Metropolitan Police: a complete alphabetical listing of officers and men, 1836-1925', which was pubished by Four Courts Press in 2001. Researchers will now be able to view details of prisoners in the online DMP Prisoners Books (also on the UCD Library's site) and then look up details of the arresting officer in the DMP General Register. IMPORTANT UPDATE, 30 Jan: There is an online index! See goo.gl/X1oXNk. In fact there are two, both accessible from this link. One is for the DMP General Register, the other from the Civic Guard (Garda Síochána) temporary register, which covers the last years of the stated timeframe. Public access has been restricted to this link since it was published here. Even MORE important update, 4 March 2019: Since the above 'important update', UCD has contacted Irish Genealogy News to advise that while Google won't allow you to view the index via the above link (which was not intended by UCD), an excel document has been prepared and is available, free, to download and filter as you wish. This is the link: https://n2t.net/ark:/87925/h1ft8j2k.